A delicious alternative to a sandwich. Slightly heat the Pitta Bread either under the grill or toaster for a minute. The bread should be more pliable when heated, and slice open the top of the pitta to create a pocket. In a bowl add the tuna, spring onions, tomatoes and mayonnaise and mix gently with a spoon. Season as required with a little bit of salt and pepper. 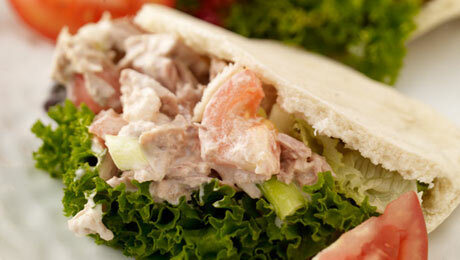 Take the pitta pocket, pile the tuna and salad filling into the middle of it. Enjoy!